The Alliance calls on the Russian Federation to comply with the Minsk Agreements. The North Atlantic Treaty Organization fully supports Ukraine and never recognizes the annexation of the Crimea by Russia. NATO Secretary General Jens Stoltenberg made a corresponding statement during the opening of the meeting of the Ukraine-NATO Commission with the participation of Ukrainian President Petro Poroshenko in Kyiv. “Russia continues its aggressive actions against Ukraine, but NATO and Alliance countries stand on your side. Alliance countries do not recognize and will never recognize the illegitimate and illegal annexation of Crimea by Russia. We are further concerned about the situation in eastern Ukraine, which has already claimed thousands of lives," Stoltenberg stressed. He also noted that the Minsk Agreements should be fully implemented, while the OSCE SMM should receive full, safe and unhindered access to the entire territory of Ukraine. NATO Secretary General thanked Ukraine for contributing to the Alliance's work over the past two decades. “We sincerely appreciate Ukraine's numerous contributions to the work of the Alliance over the past two decades. 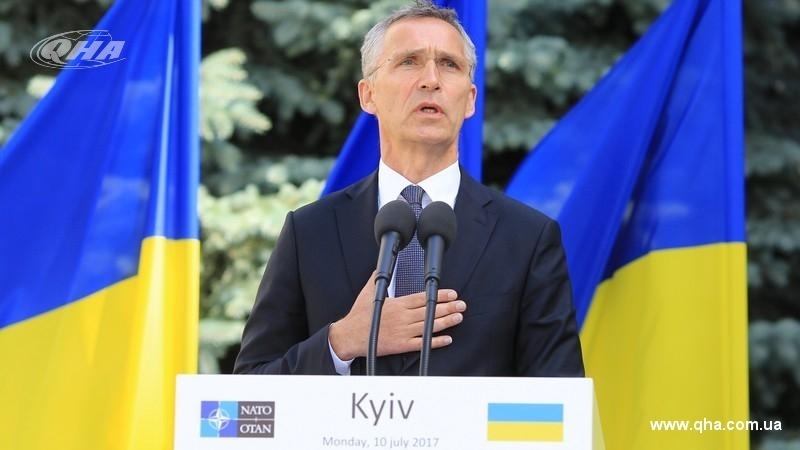 Ukraine is the only partner involved in all NATO missions and operations, including Afghanistan and Kosovo," Stoltenberg said. Reportedly, today Petro Poroshenko has declared that Ukraine and NATO began the discussion about introduction of the Plan of action for obtaining of membership in the Alliance. The President of Ukraine stressed that Ukraine is determined to reform and has a clear schedule for actions that need to be implemented by 2020 to meet the criteria for membership.